The U.S. has recently attempted to leverage China in order to help it solve the North Korean situation. The thinking is that China is the only state with significant economic clout to affect North Korea’s policy-making process. Additionally, an improved trade treaty with China has been offered by the U.S. as an incentive. While the individual merits of this approach may be debatable, it doesn’t acknowledge the possibility of additionally utilizing Russia to help resolve the crisis. Because of the current downturn in U.S.-Russia relations post-Crimea, Russia’s role in the Six-Party Talks process has been minimally acknowledged by the U.S., if it all. Certainly, while Russia doesn’t possess the economic heft of the Chinese in potentially dealing with North Korea, it does possess similar security concerns as China. Russia has an implicit agreement with China not to interfere in one another’s respective spheres of influence, such as Chinese apparent deference to Russian security interests in Central Asia. However, it’s critical to remember that Russia has Asia-Pacific interests as well. Like the Chinese, one of these is eventual de-nuclearization of the Korean Peninsula. Succinctly, further nuclearization and militarization of the Korean Peninsula has the potential to start a cascade effect in the overall Northeast Asian security decision-making process. Japan has already started a review of its defense posture in the region in order to respond to China’s rise. What additional steps may it take if the North Korean Crisis continues on its current trajectory? More fundamentally, Russia shares China’s concern that further North Korean provocations will only bring U.S. military forces closer to their borders. This is neither in Russia nor China’s ultimate interest. Lastly, Russia shares China’s concerns that any military conflict with North Korea has the potential to cause instability and increased migrant flows across their shared border. A rough analogy can be made between Belarus in Europe and North Korea in the Asia-Pacific in terms of how both serve overall Russian strategic interests. As during the Cold War, both Belarus and North Korea currently serve as buffer zones between Russia and the West. This North Korean utility is the latest chapter in the book of Russian security interests in Asia going back 400 years to the initial era of Russian expansion into Siberia. How, Then, To Approach Russia? As with China, there may be an opportunity for the U.S. to leverage Russian unease with the proximity of U.S. forces on its Asian border in order to elicit its help in resolving the crisis. Russia is already uncomfortable with NATO forces massing on the border of its Kaliningrad enclave in Europe. However, the U.S. would have to make it clear to Russia how their mutual interests would be solved by working together. Any U.S. dialogue with Russia focusing only on how the North Korean situation affects the U.S., Japan, and South Korea would be a non-starter. The economic component of this possible avenue must not be overlooked as well. 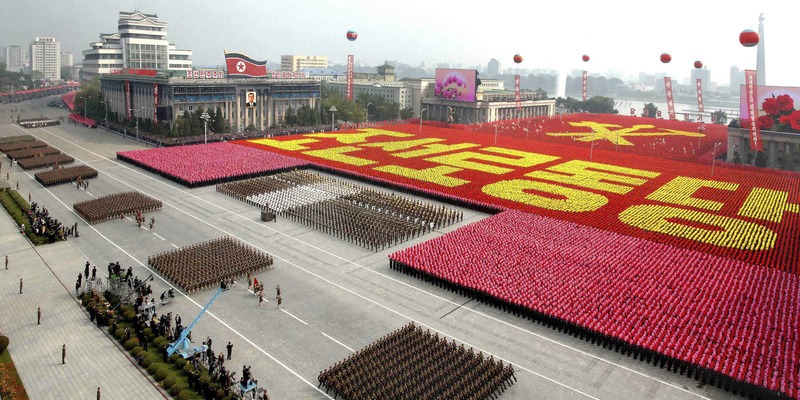 The U.S. has apparently convinced China of the necessity of strengthening economic sanctions against North Korea. An example of this new approach is China’s recent refusal to accept North Korean coal exports, vital to China’s own economic stance. However, with respect to Russia, any U.S. talk of strengthening sanctions against North Korea when Russia itself is still facing Western sanctions over Crimea would be an additional deal-breaker. Economic duress caused by continuing Russian sanctions has had ramifications all across Europe, surely impacting the current French Presidential elections, as an example. Russia definitely does not need any further sources of instability right now, politically or economically. Additionally, Japan may not share the U.S.’ current approach to confrontation with North Korea. Of course, North Korean nuclear ambitions are a concern to Japan. However, China’s rise outranks even this concern. In order to deal more effectively with China, Japan has realized that it needs to improve relations with Russia. Likewise, Russia realizes that cooperation with Japan would improve its overall Asia-Pacific security portfolio with respect to China’s ascendancy. Because of this, there may be an opportunity for the U.S. to utilize Japan as a middleman of sorts in negotiations with Russia to attempt to resolve the North Korean dilemma. Certainly, the U.S. still has limited direct negotiations with Russia, such as Secretary of State Rex Tillerson’s recent visit to Moscow over the Syrian Crisis. However, while there still are disputes between Russia and Japan, such as the Kuril Islands, Russo-Japanese relations remain better than current U.S.-Russia relations overall. It has been speculated that Russia inserted itself as a major player, both diplomatically and militarily, into the Syrian Crisis in order to gain concessions from the U.S., such as sanctions relief over Ukraine. If this is true, then from the U.S. perspective, there is a risk that Russia might try the same approach with the now-defunct Six-Party Talks to gain additional leverage with the U.S. (and Japan). However, not seeking Russian help in resolving the Ukraine Crisis, Syrian Crisis, and now North Korean Crisis may ultimately prove unsustainable for the U.S.. A choice is going to have to made by the U.S. as to which of these various crises really threaten U.S. interests in the long-term. With the apparent answer being the North Korean Crisis, Russian assistance in resolving it will be even more indispensable.